BookLust: Oh, to be young and rich and free! Oh, to be young and rich and free! 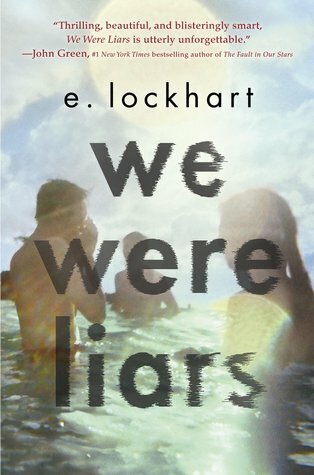 Many bloggers read We Were Liars when it first came out last year, but I admit I didn't have much desire to read it myself. It was only when I was in the library check-out line several months ago that I became interested. The woman in front of me had it to check out, and the librarian said, "Oh, you'll love this one! Especially if you're familiar with King Lear." In my experience, librarians rarely, if ever, comment on your reading choices, so her burst of enthusiasm was pretty unexpected. And really, King Lear? Who knew? (To be fair, I have never read King Lear, so it's highly unlikely I would have ever realized this connection if I hadn't overheard this conversation.) So, while waiting for all of my audiobook reserve books to come in (surely the fates will align as they always do and make all five available to me at the same time), I scrolled through my wish list and decided on this one. I am a little embarrassed to admit that I chose this one solely because it's the shortest and I didn't want to invest in a long book in case one of the aforementioned reserve titles came in. But then it didn't matter, anyway, because I quickly became addicted to the story and pretty much listened to the whole thing in about 36 hours. We Were Liars is set mostly on an island where the very wealthy Sinclair family goes to "summer" every year. Cadence is one of the eldest Sinclair cousins, and she loves every summer she spends with the family. While her mother and her sisters play all sorts of complicated games with each other for their father's favor, Cadence and her cousins enjoy idyllic days in the sunshine. Except that there's one summer that Cadence can't remember, and no one will tell her what happened. Ok, so I think that's really all I can tell you about the premise of the book. And first off, I should say that the premise is a little off because Cadence and her family all have cell phones and computers to email each other, so why can't Cadence just Google herself and find out what happened that summer instead of upsetting everyone by asking about it constantly? But, if she had done that, we would never have had this book, and if you're willing to accept that small inconsistency (and a few others that are related to that one), then you're in for a pretty entertaining read. So, anyway, I don't really want to tell you any more about the book because it may spoil it, but I will just say that I got completely absorbed in it. I don't think I even realized how wrapped up I was in the characters and the story until I noticed that I had only about an hour of the book left because I had been listening to it while I cooked, while I ate, while I cleaned, while I got ready for bed in the evening, while I got ready for work in the morning... pretty much constantly. I don't know that I can give any stronger praise for an audiobook than that. Also, after reading the story and digging a little deeper into the King Lear story, I think E. Lockhart did a good job of bringing that story to the modern day. I absolutely want to go and see King Lear performed onstage now. Actually, I would like to see multiple Shakespeare plays performed onstage. I have a feeling I would enjoy and appreciate him much more as an adult than I did as a high school student struggling with the language and all the symbolism. I've just spent a lot of time telling you very little about this book. But really, if you read any young adult novels at all, this would be a good one to try! And if you like modern adaptations of classics, this would be a good one to try. And if you enjoy fantastic audiobook narrations, this is definitely one to try. And then we can discuss the twist at the end, which was huge! Wow, what a brilliant idea about the googling, and how funny! But you're right - it would have eliminated the need for the book, LOL! And I did not know about the retelling either, even though this was on my "vague", "someday", TBR list. Now I am very curious as well! Another book which also retells Lear was Alexi Zentner's The Lobster Kings, which I read last year and really loved. (Years ago, I felt the same way about Jane Smiley's A Thousand Acres, but I barely remember it not.) It's not as though it's a favourite play of mine, but I do seem to find it satisfying in other clothes! That's interesting about librarians rarely commenting on books. That's my experience too. Sometimes I wish they would, because it would be nice to hear their thoughts. On the other hand, there are definitely also times when I'm glad that they don't! I have to admit that I wasn't rushing out to read this one either, but I should give it a try!